Peak Energy: The Limits to Growth was right ? The Limits to Growth was right ? The Guardian has an article on "The Limits to Growth", written by a pair of Australians researchers from the University of Melbourne, claiming we are currently tracking to LTG's "baseline scenario" - Limits to Growth was right. 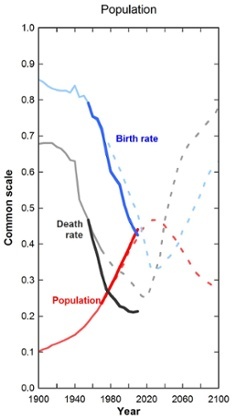 New research shows we're nearing collapse. Unlike most media reports referencing LTG it demonstrates the authors actually read and understood the book. The paper it is based on is here (pdf). 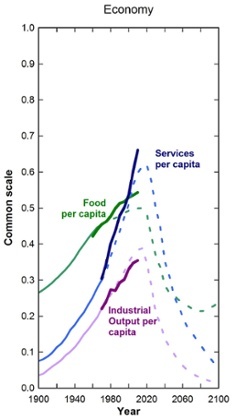 I'd like to think with a bit of determined effort that instead of falling into the "baseline scenario" outlined above that we can instead switch gears to "scenario 9" as outlined in Limits to Growth (shown below). 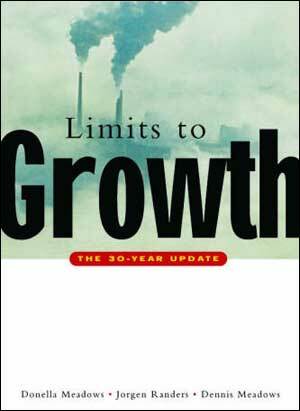 The Limits to Growth model can't be validated, because it's not a realistic model of the world. Why? Because it doesn't recognize renewable energy. It assumes that the only "real" energy is fossil fuels, and that the only renewable energy is biofuels (basically, food). 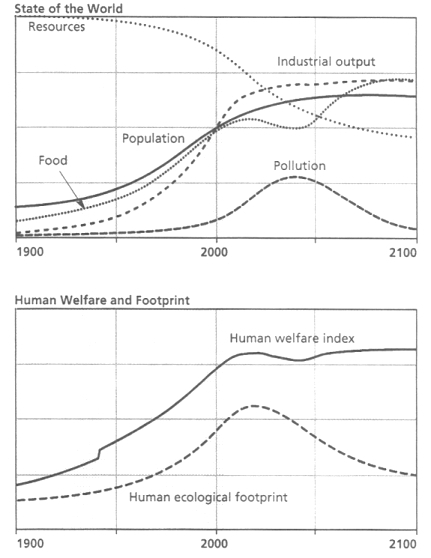 The downward "resources" curve is deeply unrealistic, when you consider the 100,000TW of energy the earth is bathed in every second of every day. The roughly 10TW humans generate isn't even a rounding error on that scale, and we certainly aren't depleting the energy available to us. Do you mean the baseline scenario doesn't include the takeup of renewables or that none of the scenarios do ? If you read LTG, following the scenarios is a section entitled "Transitions to a sustainable system", which recommends a wide range of practices to be implemented in order to make scenario 9 the one which eventuates (which presumably is the one most people would choose if given the option). I'm assuming renewable resources meant more than biofuels - will have to go back and check ! Yes, it's my understanding that none of the models include what we think of as renewables: wind and solar, hydro. The model is just too simple: it has two categories: non-renewable energy and agriculture (which I presume includes biofuels). That's how you can get that highly unrealistically declining "resource" curve. "This is a guest post from Dolores García, an independent researcher based in Brighton, UK. Recently Jorgen Randers (best known for being one of the co-authors of The Limits to Growth, 1972) asked me to do some modelling work on the World3-Energy model, an updated version of the classic World3 computer model that was used in The Limits to Growth that includes a much larger amount of information about energy. He’d like to use it for the next book that he intends to publish sometime in 2012. Part of the work I’m doing for Jorgen Randers is comparing the results of World3-Energy with IEA’s results. I thought the readers of The Oil Drum would be interested in this." "in a world with unlimited energy, any chemical compounds useful as a raw material but not as an energy source could be easily obtained "
"The available data on EROEI is very spotty, but it’s such a crucial concept to explain what may happen in the future with energy sources that I believe a model would be inaccurate if it didn’t include it in some way." "Renewables aren’t used until the end of the 21st century, due to their low EROEI: "
4) Reneweables have high EROEI*, therefore, the energy component of the model is incorrect, and so is the overall model. So, the model needs a basic revision to be valid. *According to the Hall reference, it's 18:1. That's clearly high enough. OTOH, that number is outdated - the correct number is closer to 50:1. Also, Hall's numbers for solar are badly out of date, and should be much higher. Also, the idea that nuclear fuel will be depleted within the 21st century is unrealistic. At some point, every model fails. I guess the interesting question is has this model failed yet? The authors of the latest paper suggest no, and given the standard run of the model is doing so well after 40 years should be cause for pause. Given the base run version of the model projects so many turning points near 2020, we wont have to wait long to find out if the extraordinary run continues. The points made by Nick G may be true, but it would really only become important sometime in the future. The model appears to be tracking reality most probably because renewables simply are not, globally, a very large contributor yet. If as BG suggests a concerted switch is made then the standard model will no longer be accurate, but a different run by the LTG team may. So...? Instead of saying the model is not valid, exploring why this model run is still relatively accurate given its weaknesses might point us to interesting new information. And wasn't that the point of the authors of LTG? Given a set of explicitly stated assumptions this suite of models was used to explore, crudely, probable trajectories. Anyone is free to take the code, improve the "invalid" empirical bits and rerun. Point me to any "valid" economic model, they are all lumpy aggregated empirical beasts that assume a certain kind of human behavior. has this model failed yet? In the words of a famous physicist, "it's not even wrong". These are scenarios - something that even the authors seem to have forgotten. They're intended to test a very narrow set of propositions. In particular, they tell us something interesting about the behavior of a system with hard limits and feedback lags, which is that you can get a dangerous "overshoot". But, they're not models of our familiar world. 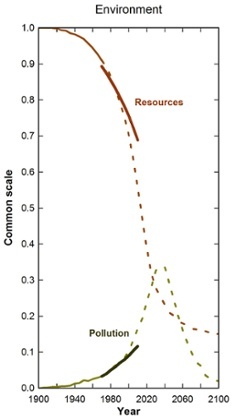 In particular, the "resources" curve has very little to do with the real world: it models fossil fuels with hard limits and no good, fast substitutes. That doesn't match up with the reality of the resources available to us, where the limits to fossil fuels are very "fuzzy", and there are very good substitutes right at hand. given the standard run of the model is doing so well after 40 years should be cause for pause. Most of the "historical" curves we see here don't differ from the model because the model doesn't differ from conventional wisdom. The LTG model's significant differences with conventional models are in the future, which is not yet tested. The one interesting phenomenon where the LTG scenarios might actually be useful is for Climate Change, where there are very large feedback lags, and where there may be sharp limits beyond which we see enormous damage to our environment. But that's not what "peakers" focus on, apparently because it doesn't fit with their focus on limits to commodity resources. 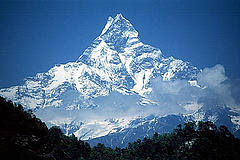 The fact is that Peak Fossil Fuel would be to our benefit. The fact that we're only getting Peak-Oil "lite", and that there's very little sign of Peak Coal (or Peak Gas) means that we'll have to make fairly conscious political choices to keep carbon in the ground. Sadly, the fossil fuel industry is very good at blocking that.